Brother HL6050DN is a compact monochrome laser printer ideal for home and small business owners. The printer is highly affordable for workgroups. It has a user-friendly interface and connects to Ethernet very easily. The medium-sized printer is 20.8 kg in weight and 40.0cm (W) x 42.5cm (D) x 31.0cm (H) in dimension. Brother HL6050DN Printer comes with an automatic duplex system which allows the user to print both sides of the pages simultaneously without any manual supervision. The print speed corresponds to 24 ppm. The speed is relatively slow compared to other workgroup laser printers. The main input tray capacity accommodates 500 sheets with additional 100 sheets multi purpose input tray. This capacity is expandable by adding secondary input tray of 500 sheets which is optional. The Printer features a separate toner cartridge and drum unit which are easily replaceable. The Original Brother HL6050DN Toner Cartridge yields 7500 pages at a coverage of 5%. Hence, the drum doesn't require a replacement at short intervals. The printer has a maximum memory storage up to 32 MB. It has a standard resolution of upto 1200×1200 dpi for both text print and graphics. This adds to the crisp and clear output quality of the printer. It also has an LCD backlit display operable in dim-lighted environment. It is compatible with Windows and Mac systems. 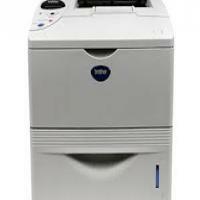 Brother HL6050DN Printer is best suited for home and small offices. It's durability, easy network connectivity and large expandable input capacity add to its affordability. The printer is a good choice for workgroups and growing businesses. Q. What are the advantages for ordering compatible Brother HL6050DN toner cartridges over the original ones? A. Our compatible Brother HL6050DN toner cartridges are much cheaper to purchase compared to the original cartridges. We assure that you will not be making any compromise on quality as these cartridges are rigorously factory tested to the same ISO standard as the original brand ink. These are also environmental friendly. Compatible cartridges are made by third-party manufacturing company not the original company but the quality is same as the originals ones. Q. How much power does the Brother HL6050DN printer consume? A. It consumes Less than 600 WH during printing, Less than 110 WH on standby and less than 8 WH in sleep mode. Q. I am planning to buy the Brother HL6050DN printer. What can I expect to receive in the box? A. You can expect to receive Drum unit assembly (with toner cartridge included), Main unit, AC Power cable, CD-ROM and a quick setup guide in the box. Q. What will be the shipping cost if I order Brother HL6050DN Toner Cartridges from this site? Q. How will I get to know if the toner level of the Brother HL6050DN Toner Cartridges in my printer is low? A. If the LCD on the printer shows TONER LOW, it means that the toner cartridge has nearly run out of toner. You should purchase a new toner cartridge and have it ready before you get a TONER LIFE END message on the LCD. Q. Will the Brother HL6050DN printer work with my MacBook Pro? A. Yes, this printer is compatible with your MacBook Pro as long as it is Mac 8 or greater. Q. My printer’s drum unit has run out. Do you supply drum unit along with the Brother HL6050DN toner cartridges? A. We do supply Brother HL6050 drum unit along with toner cartridges. However, you need to mention in your order that you require a drum unit along with the Brother HL6050DN toner cartridges. Q. I want to install an additional memory to my Brother HL6050DN printer. But I am not sure exactly how do I go about doing it. Could you please help. Thanks. A. Sure. The step-by-step procedure given below will help you install an additional memory easily. Q. Do you provide any exclusive offers and discounts on your website? I am looking out to buy a set of Brother HL6050DN toner cartridges from your website. A. Yes. We do have special offers and discounts on numerous products listed on our website. However, please note that they are not personalized offers. We keep updating our product pages whenever there is an exclusive offer or discount available. Each product supplied by us comprises different offers and discounts. You can always check them at the beginning of the product page. If you wish to buy Brother HL6050DN, you can check for offers and discounts at the beginning of the page.